Clearly, the vast majority of all visitors to Melk come for the monastery, as it is arguably the most famous, most elaborate and most important of all the nation′s many monasteries. However, visitors should not ignore the small town of Melk surrounding the abbey. There are plenty of sights that are worth a closer look once you manage to penetrate the thick layer of tourists that crowd the place especially during the summer. Alongside with other towns by the Danube, Melk is mentioned in the ancient Germanic epos "Nibelungenlied" or "Song of the Nibelungs". Its mid-high German name was Medelike, but apart from the epos, dateable records go back to 831. Right after the birth of Austria in 976, Melk became the first "capital" of the Marcha orientalis or Eastern Mark. Markgrave Leopold I of Babenberg ordered the extension of a previously existing settlement and built himself a fancy little castle. His successors added relics and the state treasure to Melk. An important move in the history of Melk came in 1089, when Markgrave Leopold II gave the castle to Benedictine monks from Lambach. 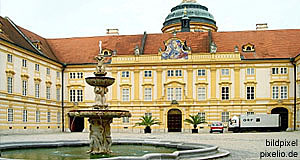 Ever since then, Melk Abbey played a crucial role as a spiritual and cultural centre in Austria. This became particularly obvious in the 15th century, when the so-called Melk Reforms changed monastic life in the entire Holy Roman Empire of German Nation, if not all of Europe. I already wrote a few paragraphs on Melk Abbey in my article on the monasteries of Lower Austria and Vienna. In the following, I will therefore concentrate on the town of Melk. In 1227, it earned the privilege of arranging a market, which added vastly to its economic significance. However, it wasn′t until 1898 that Melk gained the status of a city. Today, it has less than 6,000 residents and its "urban" flair is rather non-existent. It does have significance in tourism (obviously) and transportation, though: The east-west motorway and main railway run across Melk and the Danube is an important waterway. Little known fact: From April 1944 to April 1945, a side-branch of the Upper Austrian concentration camp Mauthausen was maintained in Melk. Sightseeing in the centre of Melk should include a glimpse at the Rathaus or City Hall, the Kolomanibrunnen Fountain, the Old Bakery and the Baroque Old Postal Office ("Altes Posthaus"). Melk is also a well-known venue for art festivals. On the day of St Koloman (13th of October), whose relics are kept in Melk Abbey and who is the patron saint of both city and monastery, a fair is organised. This is an annual tradition that dates back to 1451. In July and August, the "Melker Summerspiele" or "Melk Summer Festival" are another big event and each year at Pentecost, the "Melk Baroque Days" are held, an international festival of Baroque music. Attractions near Melk include the Schallaburg Castle, Franzensburg Castle, the basilica Maria Taferl and the town of Pöchlarn. The main attractions in the Wachau are all downstream of Melk: The ruined Burg Aggstein Castle, Spitz an der Donau, Weissenkirchen, Dürnstein and Krems.